Hong Kong-based AB Concept inaugurated the stunning design for the world’s first CE LA VI, a club, restaurant and rooftop bar conceived around a unique blend of passion, intrigue and Southeast Asian flavour, representing the lifestyle brand’s inaugural venture with a mind-blowing venue in the heart of Hong Kong. 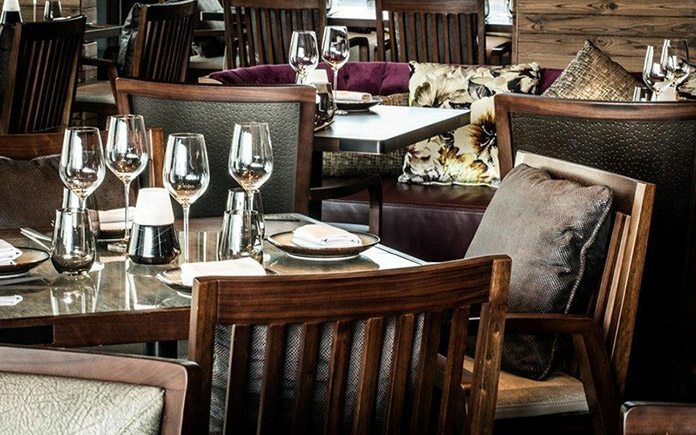 Since its launch in 1999, AB Concept has earned a reputation as the design firm of choice for the world’s leading hoteliers, luxury developers, and premium restaurant operators. Led by co-founders Ed Ng and Terence Ngan, AB Concept is widely regarded as one of the most innovative, integrated and internationally acclaimed design studios in Asia. 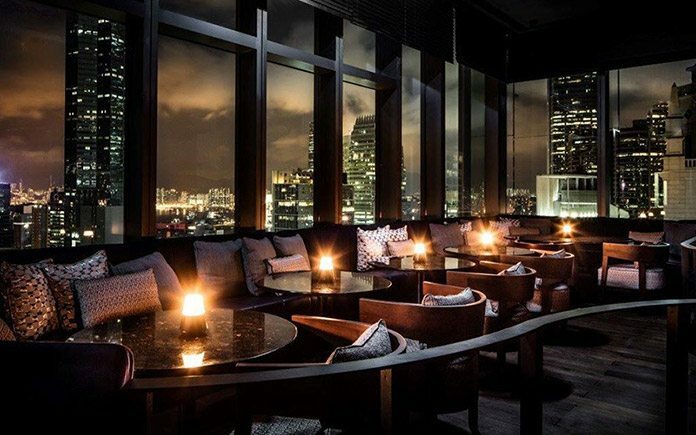 Based in Hong Kong with offices in Bangkok and Taipei, AB Concept comprises of a leading team of interior designers supported by project architects; in-house production, graphics, products and FF&E teams from almost a dozen nationalities. Each of their designs tells a unique story through a spatial experience that is underpinned by the essentials of Architectural precision in space planning and a Bespoke sensibility that reflects the artisanal quality and craftsmanship of each project. These essentials are evident in each of their works – from luxury to lifestyle brands, from projects in Asia to those in Europe, from architectural to interior to FF&E design. 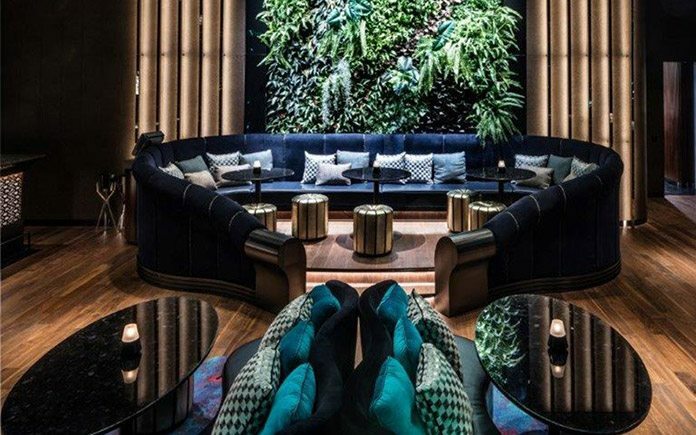 AB Concept’s ever expanding client portfolio includes the Four Seasons, Mandarin Oriental, Rosewood Hotels and Resorts, W Hotels, Waldorf Astoria and Shangri-La Hotels, while the company’s diverse projects span across Asia Pacific, the Middle East, Europe and beyond. In 2012, they released their first book, The Language of Luxe, to critical acclaim. Filled with natural materials such as lava stone, ship’s wood, rattan and nourished with live plants in the form of vertical gardens and green chandeliers, the creative vision for the new venue brings the feel of the tropical rainforest into the concrete jungle while constantly paying homage to CE LA VI’s commitment to harmony and balance. The motifs and colours of the Southeast Asian landscape occur throughout the venue, using shadow and textures to masterfully create a seductive, intimate and sensual atmosphere. 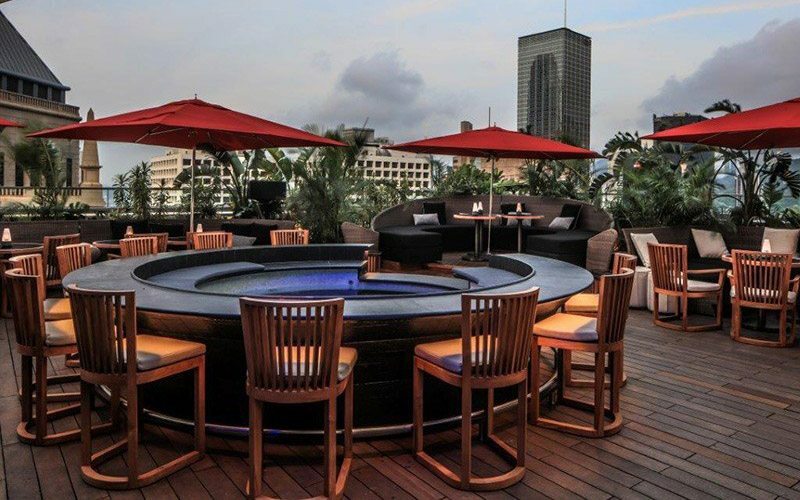 Combining elements that reflect CE LA VI’s five pillars of design, cuisine, mixology, entertainment and venue, the multifunction space manages the rare feat of successfully blending a restaurant, bar and club all in one iconic location. 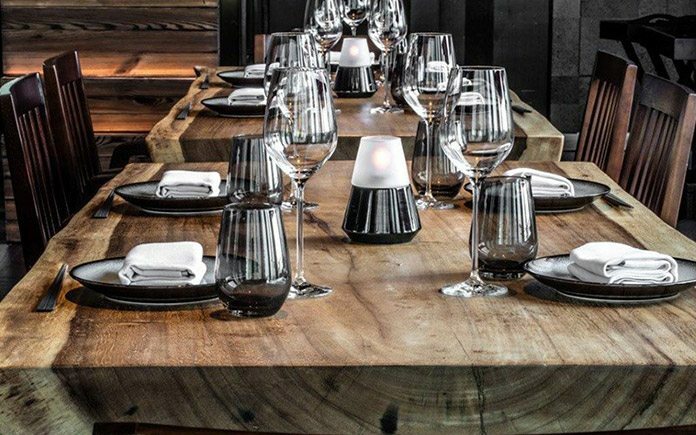 The result is a sensory experience overflowing with personality and spirit that evokes not only a gastronomic adventure and a tantalising odyssey but also a spiritual voyage. 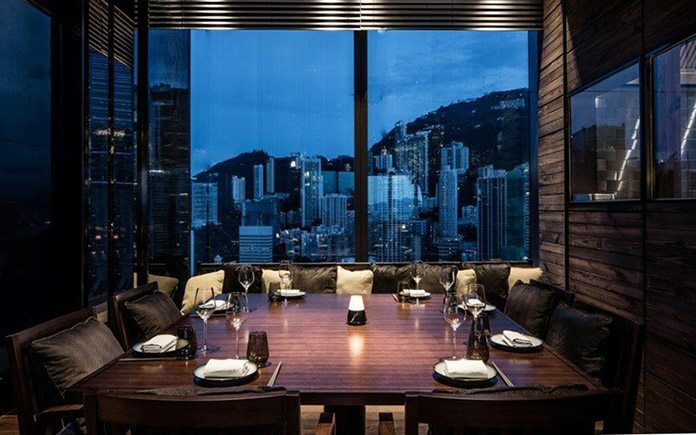 CE LA VI will officially launch on August 13 and represents the first of the international expansion, which will all take their design cues from the Hong Kong venue. 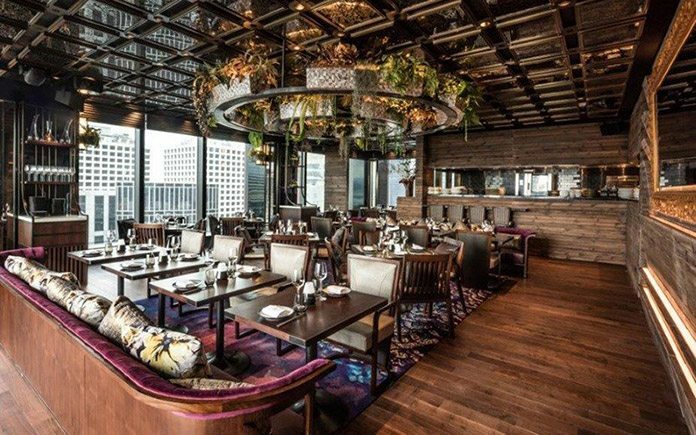 The next AB Concept-designed CE LA VI is the renovation of the iconic Marina Bay Sands venue in Singapore, and continue with venues in Taipei, Bangkok and Dubai. From the entrance on the 25th floor, guests are immediately treated to a glimpse of what lies within. The brand’s signature red is translated into a hanging screen, both architectural and organic in profile, inspired by the stepping silhouette of Asian temple discs. The bold contrast of the sensual red eel-skin frames and the raw lava stone surrounds create an interesting juxtaposition and tactile space. From the arrival, guest can walk straight through to the Lounge and Club area, the pulsating heart of the venue. The Nest marks the center of this space, with a raised VIP seating area and a downlit DJ booth flanked by dancer platforms in black steel. 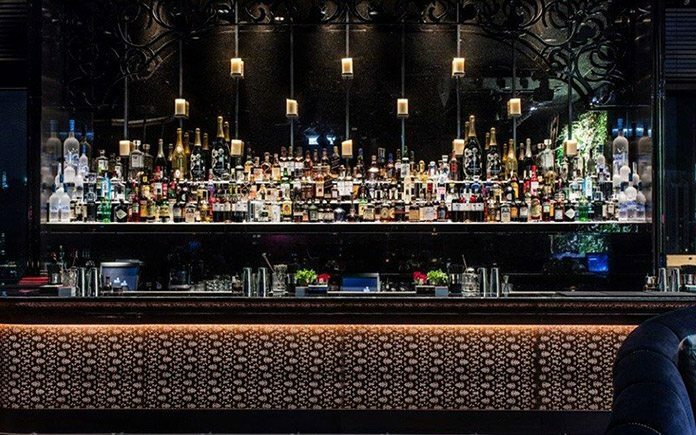 The elegant bar features an antique mirror backdrop with drop candles and a granite counter set off with perforated pony skin, which at night lights up to reveal a floral motif. LED lighting adds to the moody ambience while flexible seating arrangement gives the area a different look and feel for day and night. The bespoke Tai Ping carpet bearing a similar oriental motif helps create a softer atmosphere while wooden flooring and a stunning vertical garden all conspire to transport guests to a tropical wonderland. The common washroom area on this floor features a spectacular ceiling-high live green pillar surrounded by walnut veneer wood, as well as black vanity mirrors etched with floral motifs and lava stone washbasins. 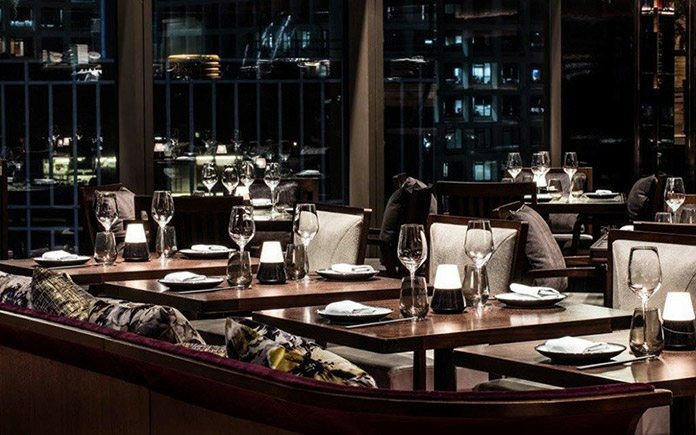 Down one level is the restaurant, where guests arrive in the embrace of a spectacular backlit wine cellar enveloping the lower lift well under an antique mirrored glass ceiling. But the soul of the restaurant truly lies in the dramatic custom-designed green chandeliers, a living object overflowing with a host of exotic plants. 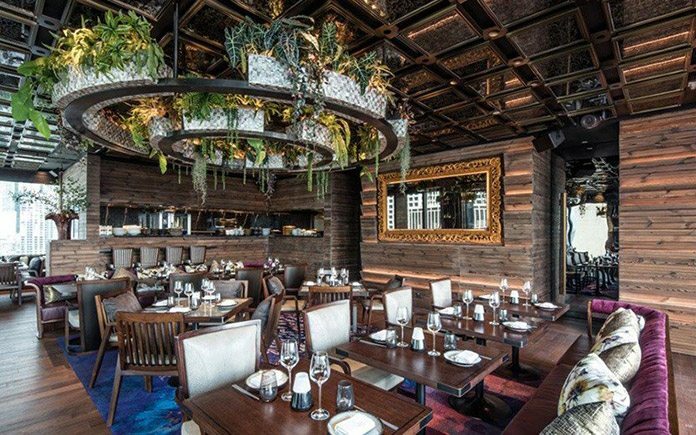 Wall sconces filled with greenery add to the rainforest concept, while tabletops mimic picture frames, each featuring exotic bird feathers recessed under the glass. Mother of pearl flower pots allow light to wash down from the exterior and outlines the silhouette of the growing plants. 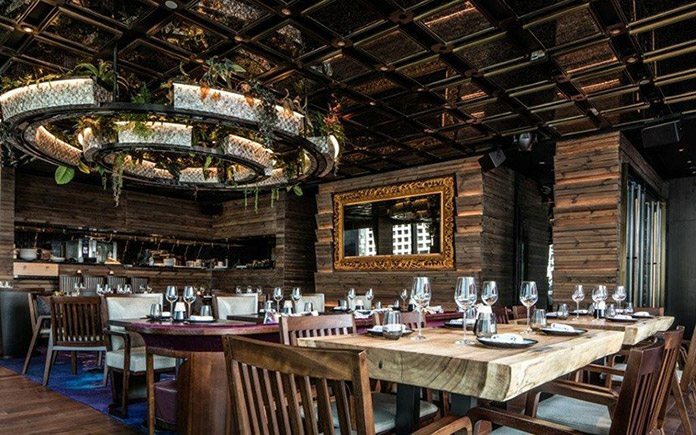 Accent colours and gold gilded picture frames give the room a lighter and more sophisticated feel than the club upstairs, while outdoor seating covered by the signature red canopy allows guests to enjoy the natural tropical atmosphere in the open air. 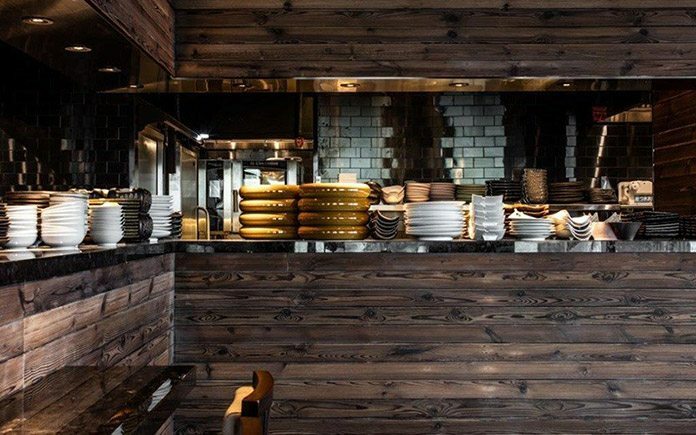 A long, raw-cut wooden table hand picked from Bali is reminiscent of rustic tropical beauty, while a semi-private dining area is separated from the rest of the restaurant by a sheer curtain. Those in the main dining area are treated to the view of an open kitchen, bringing all the action from the chefs into the space. 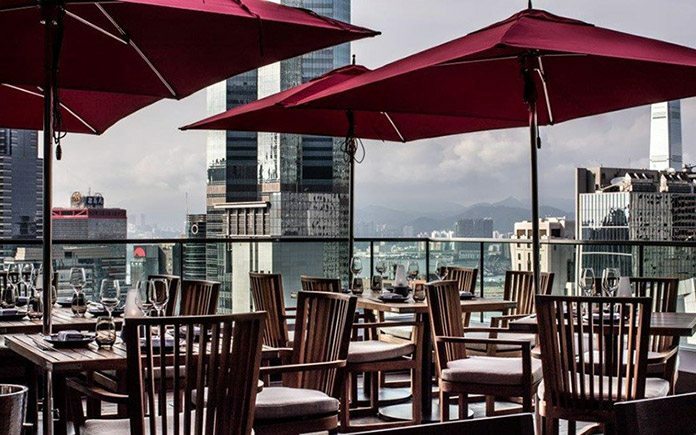 The roof terrace delivers a stunning view of the Hong Kong skyline and is decorated with rattan, red umbrellas and rustic ship’s wood. Lush landscaping embraces the entire rooftop space, creating an unworldly experience and urban sanctuary. 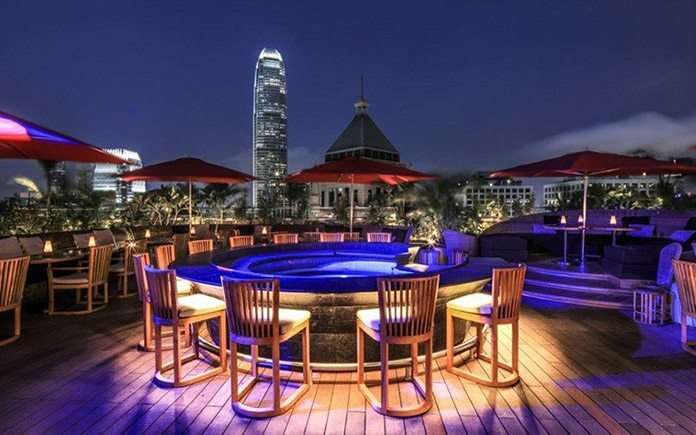 The design focus is the Jacuzzi – one of very few on a Hong Kong rooftop – a glamorous and playful centrepiece surrounded by flexible lounge seating and a raised private VIP area that can double as a DJ booth. Outdoor materials such as wood decking, beige textured stone and mosaic patterns create a rustic edge. 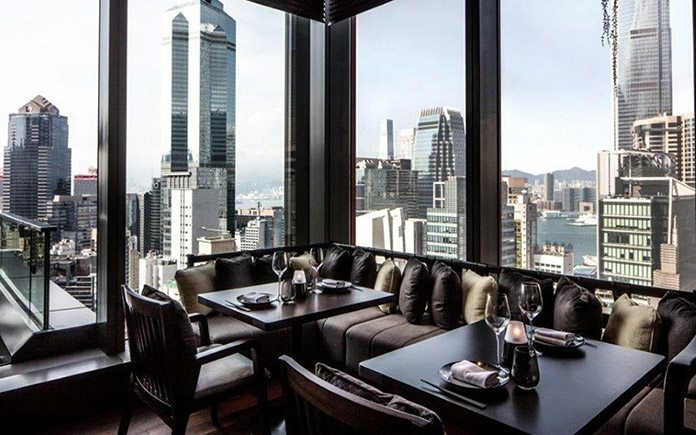 The backlit bar which sits under a red canopy is fringed with plants and an extensive display of wines and cocktails, providing the backdrop for the ultimate space to enjoy first class views of Asia’s world city.